I adopted a retired Premier Japanese Bobtail from a breeder who I met at a cat show. A month or so later my 16 year old black and white cat passed away. 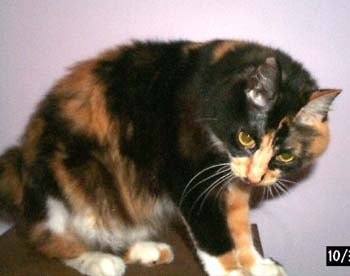 I was soon after contacted by the breeder who said she had a spayed female cat about a year old who needed a home. She explained that Tootsie as she is called was somewhat handicapped but was a cheerful little cat who could get around very well. She just fell over sometimes, and would run into things. The breeder was unsure of the cause but felt something was wrong with her front legs of an orthopedic nature. Well, we took the little cat in, and she was very small and skinny, weighing only a little over 5 pounds. We began to feed her Fri skies cat food and she developed a bad diarrhea. Immediately upon seeing her my veterinarians diagnosed her with neurological problems. The diarrhea was treated, she got well and gained weight. She seems to still have some trouble with her bowels but by feeding her only Friskies Turkey or Chicken, canned and Dental diet she has been okay. 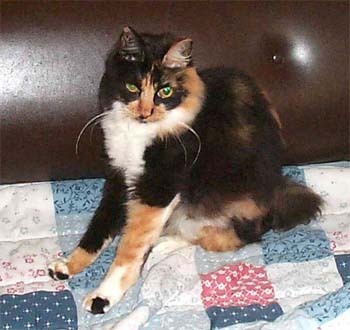 Recently, Tootsie ran a fever and her one leg collapsed. I thought it was the end. However the vet said lets treat her, he didn't know where the infection was. With antibiotic, she felt better almost immediately and could walk on the non working leg again. Even after that she took about 3 weeks to become more like her old self and now she is eating and playing well. I am very pleased because she is such a cute, ant funny little cat. She and Johnny the original Bobtail get along well but do have some childish spats. The surprising thing is that Tootsie in many ways seems to be the dominant cat. This is so surprising. 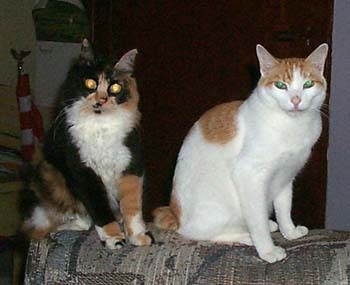 In the picture, Tootsie is the calico, Mi-ke..